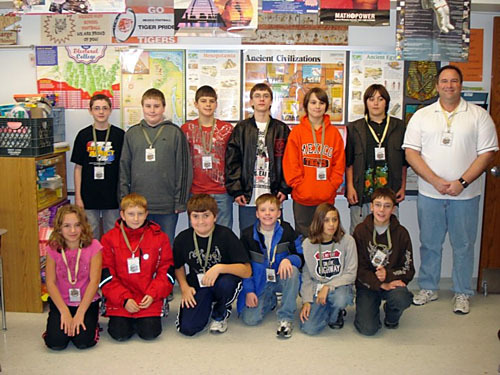 Teacher Jeff Baum in central NY state says "In our Mexico Middle School, "Ancient Coin Club", we provide club members with a membership card and coin holder to show active status." Teacher Jeff Baum in Mexico, central NY state writes "In any organization, there are items provided to members to solidify participation and unity within the group. 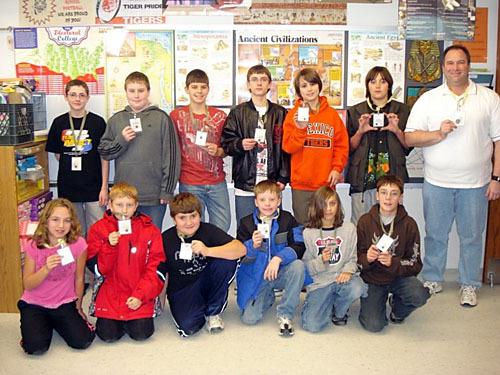 In our Mexico Middle School, "Ancient Coin Club", we provide club members with a membership card and coin holder to show active status. The membership card, holder and attached lanyard were developed as a useful way to hold student membership card, but also provide a practical approach for holding an ancient coin." Austin, bottom row, far right, last year received a special Silver Denarius prize from the famous numismatist, David Sear, for his knowledge of Julio-Claudian History! 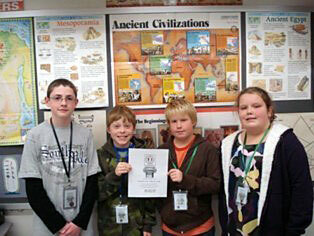 Congratulations to Jeff Baum - a teacher who makes learning Ancient History an exciting experience for his students.